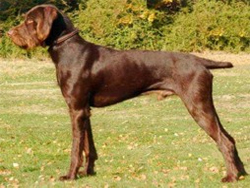 The Pudelpointer is a hunting dog breed that was developed in Germany in the late 1800's, at a time when many of the other versatile breeds were developed. 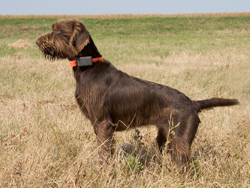 The Pudelpointer was developed by crossing the English Pointer and the German Hunting Pudel. The hunting dog that transpired from this breeding has a great love of water, strong retrieving instincts, intelligence, trainability along with a protective harsh wiry coat. The Pudelpointer is a medium size dog weighing 45-70 lbs. Coloring can be from a tawny-brown to a dark brown and there could be black at times. White markings may appear on the chest and feet. With their even temperament, cooperative nature and willingness to please they make very good companion dogs in the home and hit the field running. Additional breed information for the Pudelpointer can be found at the Pudelpointer Club of North America.